Edamame beans are a kigo for autumn. are a kind of edamame. 'the king of edamame' as some say. This is a speciality of Tsuruoka town in Yamagata. The hair on the pod are green and the indent between the beans rather strong. They do not look very pretty, but their taste is exceptional with a strong flavor toward SWEET. They are peculiar about the soil they grow in and not suited to many kinds of cultivation. Many are still picked in the wild. Their harvest time is short (July to September) and they do not keep long in store shelves, so they are mostly consumed locally. They come in many varieties, higan-aoi among them. The main area of cultivation is the village of Shirayama 鶴岡市白山（しらやま）in the Tsuruoka town area. Now many are also planted in the Shonai plain near Sakata town at the foot of Mount Chokai, but this is not the original location. The town of Tsuruoka is trying to get the license for this brand name. kono edamame wa doko no dadacha no tsukutta mame da ya? These delicious beans, which daddy produced them? Since then, they have been called dadacha beans. Another version says, because the father of the family (o-toosan, oyaji, dadacha in the local dialect) was the first to taste them, hence the name. Nowadays dadacha is not used much to adress one's father, it does not seem polite enough. Nowadays it is eaten fresh but there are also many snacks with it. See haiku by Matsuo Basho below. 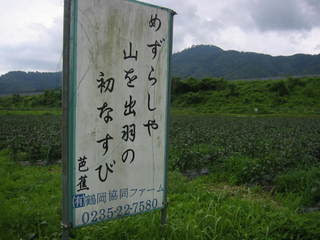 At the foot of mount Kinbosan (Kinboosan) 金峰山 there is a small village called Minden where these eggplants are grown. More than 300 years ago a visitor from Kyoto brought some seeds from eggplants to this village. They area also prepared as karashi 辛子漬け mustard pickles to keep for a long time or as hitobanzuke 一夜漬け over night pickles with salt. The poor people of the mountain areas did not waste one grain of rice. After cooking in a pot, all leftovers were carefully picked up and eaten ... tasting good with the clear water of Yamagata. Nowadays, cooked rice is washed, put in bowls and water added to the brim. This is a lunch speciality in the hot summer months, eaten with a few pickles of cucumbers and eggplants. In some areas of Northern Japan edamame still in the pod are boiled with miso soup, to give it a special flavor. Some say the miso soup tasts like crab miso soup. Yamagata is famous for its fruit, cherry and more. One of the premier festivals of Yamagata Prefecture, Shinjo Matsuri is a Summertime celebration held on August 24 - 26 annually. Held since 1755, the festival was established by the local Daimyo (feudal lord) to lift the spirits of the common people after a particularly bad harvest. 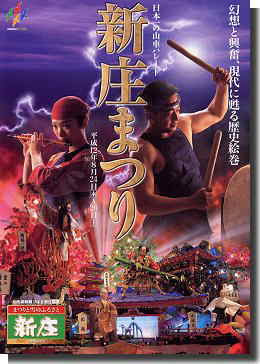 The current incarnation of the festival includes traditional dancing, a reinactment of the first "Daimyo Parade", traditional festival vending stalls, and the Yatai Parade. The Yatai Parade is the premier event of Shinjo Matsuri. Each neighborhood in the city constructs large, vivid scenes from Japanese/local history, folklore, and/or fairy tales on wide floats. These are then pulled throughout the city by children both at day and at night for the three days of the festival. A traditional hayashi band of taiko drums, cymbals, shamisen, and Japanese flute follow behind. The hands, feet, and faces of the figures on the floats are traditional Noh design and many floats cost as much as half a million yen to build. The floats are judged and the three winners displayed in Shinjo Station, and the Shinjo History Center. The rest are dismantled. "After we confined ourself in Haguro-Sanzan Shrine to pray for seven days, we have come down to Tsuruoka Town. Then we are given a warm welcome at Nagayama Juko's residence. How delicious the new eggplants are at the dinner." The year's first eggplant of Dewa. A greeting hokku for his host, Nagayama Shigeyuki 長山重行.